David Braben made his name in gaming. His programming skills allowing him to co-create Elite - one of the most iconic games of the early home computing explosion and launch a career as founder of Frontier Developments developing platforms and games. But, he tells TechRadar, in the last few years he has found it increasingly difficult to answer the inevitable question of how today's kids could follow his path into tech and gaming. That was the reason he became an investor in the pared down, ultra-cheap computing phenomenon that is Raspberry Pi. "I actually felt guilty about the opportunity I had had," he said. "I had so many people asking me 'how do I get my son or daughter into all this' and it felt mealy-mouthed to tell them that the opportunity wasn't really there. "I couldn't just say 'Buy them a BBC Micro!" And so I don't see Raspberry Pi as an investment, I see it more as a means to an end to achieve something that I felt bad about. "I think there is a coolness to Raspberry Pi that is reminiscent of the '80s." This was, of course, an era of the Acorn, Sinclair's ZX Spectrum and the Micro - cheap, readily available and proliferating through Britain. It's no coincidence that the cottage industry of programmers who embraced this computing world remain major players - people like Ian Livingstone, founder of Eidos, Braben and Peter Molyneux. The current oft-called 'console' generation's access is more complex - although Braben does not believe that the rise and rise of the likes of PlayStation and Xbox cannot be blamed. "I don't blame consoles," he said. "For a start, the NES was around in that era. "I think the problem was that the home computer became unfashionable. People forget that programmers like Eugene Evans were on the front pages of papers and were painted in a positive light as making improbable amounts of money. "There were whole television programmes dedicated to the BBC Micro and it sent out a message that an interest in computers wasn't something to be embarrassed about. "If you wind forward five years - that had changed dramatically. It became fashionable to say it was dull and very rapidly you saw readerships of the magazines falling away and people who persisted were laughed at. "So many people were put off by that - and they probably would have loved it. From the outside it looks dull but when you get into it it's wonderful. "It's our duty to make the barriers to getting people into this as low as possible." The Raspberry Pi is partially Braben's answer to this, although he believes that there are social changes needed; not least the need to persuade talented young programmers to eschew the big money jobs in the city and work in areas that interest them rather than pay well. "Some of my contemporaries went into finance and, at Frontier, our primary competition for developers have been the banks. It comes down to money versus pleasure. "We've had stands opposite Goldman Sachs who, it's fair to say, pay better than we do. But a lot of the people who choose money start to think in five years or so, "What did I do?" "But by then people are in a position where it's very difficult to go back to what you would have loved. "I'm proud of what I do and it's still exciting to me. It's fun and interesting and there are not many careers where you can do everything from voice acting to graphics!" 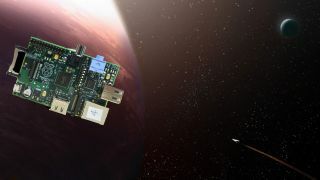 Braben has been railing against legislation in the UK that meant that it made more economic sense to have the Raspberry Pi assembled abroad and brought in as a completed computer, rather than importing the components and assembling the unit in Britain. Despite this, Raspberry Pi is now put together in Wales - much to Braben's delight. "We will work with whatever initiatives we can among the people who want to change things," he added. "We've brought Raspberry Pi manufacturing back to the UK and I'm really proud that we have been able to do this." And, with a bit of luck, Braben's also helped bring back a chance for the next generation of Brits too.